Jeff Sessions reverses the Obama administration’s position in a crucial voting-rights case. Ahead of a crucial hearing in federal district court tomorrow, the Trump administration is reversing the Obama administration’s opposition to Texas’s strict voter-ID law, withdrawing the federal government’s claim that the law intentionally discriminates against black and Latino voters. Texas’s voter-ID law—which allows voters to cast a ballot with a handgun permit but not a student ID—has already been blocked three times by federal courts. A federal district court in DC first blocked the law in August 2012. But after the Supreme Court gutted the Voting Rights Act in June 2013, ruling that states with a long history of discrimination no longer had to approve their voting changes with the federal government, Texas’s law immediately went into effect. Thousands were disenfranchised as a result. I’ve been telling their stories for years. Elizabeth Gholar was born in rural southwestern Louisiana in 1938, in the small town of Jennings, the county seat of Jefferson Davis Parish. After growing up in the Jim Crow South, she felt voting was always important. In 2013, after retiring as a school cook, she moved to Texas to live with her daughter in Austin. She had a driver’s license and birth certificate from Louisiana, but ran into problems when she tried to get a driver’s license in Texas, which she needed to vote. She was told that the name on her birth certificate, which had been incorrectly filled out by the midwife who had delivered her at home and listed her mother’s maiden name, had to match her current name. The law was blocked again in September 2014 by a federal district court in Texas. Judge Nelva Gonzales Ramos found that 608,470 registered voters in Texas, 4.5 percent of the electorate, did not possess the limited forms of government-issued ID required to cast a ballot, with African Americans three times as likely as whites to not have a voter ID, and Hispanics twice as likely. She ruled that the law, known as SB 14, violated Section 2 of the Voting Rights Act, which the Supreme Court kept in place. However, they disagreed with Ramos’s finding that the law was intentionally discriminatory and urged the district court to hold another hearing to reexamine the issue. That will take place tomorrow in Corpus Christi. The Fifth Circuit also allowed the law to stay in place but said those without strict photo ID could cast a ballot by signing an affidavit stating they had a reasonable impediment to obtaining ID. More than 16,000 voters used this option in 2016. 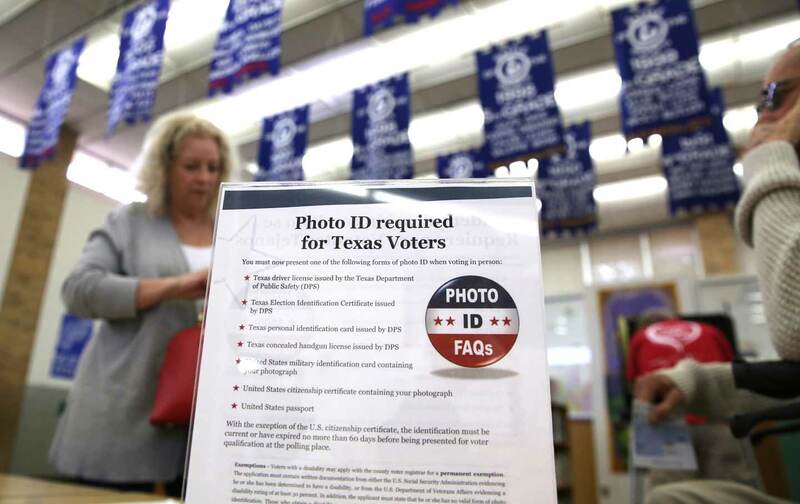 However, counties across Texas still wrongly told voters strict photo ID was required to vote. A similar ruling in Texas’s voter-ID case could set an important precedent. “The intent part of the claim is really important,” says Gerry Hebert of the Campaign Legal Center, a former high-ranking official in the Civil Rights Division. The case will still proceed with civil rights groups arguing against the voter-ID law, but they will no longer have the federal government on their side. Nothing has changed to make the law any less discriminatory, except now there’s a new administration that is trying to suppress votes instead of protect them. The DOJ’s brief in Texas is a disturbing preview of what’s to come.